The 2018 Belfast Film Festival is set to host 118 premieres out of 178 films ranging from features to short films to Virtual Reality (VR) titles drawn from 30 countries around the world. 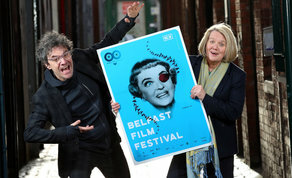 The festival, which takes place across 22 locations in Belfast, will also see a number of special events including in-depth Q&As with well-known Father Ted writer, Graham Linehan and Director Ken Loach who is set to receive the Réalta award for outstanding contribution to cinema. The festival kicks off on 12th April with the Lance Daly directed film ‘BLACK 47’ as the opening gala and continues through to 21st April. Belfast Film Festival to welcome Ken Loach to Northern Ireland to receive the Réalta award for outstanding contribution to cinema. Ken will take part in a special Q&A. ‘THE BREADWINNER’ - Directed by Nora Twomey (Parvana is an 11-year-old girl growing up under the Taliban in Afghanistan in 2001. When her father is wrongfully arrested, Parvana cuts off her hair and dresses like a boy in order to support her family. Working alongside her friend Shauzia, Parvana discovers a new world of freedom and danger). More than 20 films at this year’s Belfast Film Festival will have a ‘F’ rating which identifies if a film is directed, written or produced by a female or has a strong female lead or storyline. The response comes off the back of the recent global movement to change the culture of how women are treated in the film industry and how they are represented on-screen.